Homeowners take great pride in the exterior of their home. The concrete driveway has become an essential part of a landscaping plan that imparts an inviting image. 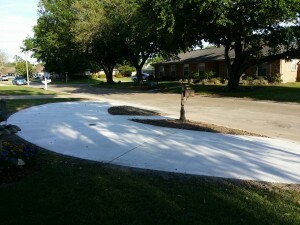 Bayou Concrete® specializes in exact replacements, from regular broom finish to decorative concrete. The concrete driveway is one of the most prominent and immediately noticeable things about most homes. Enhancing your property with a stunning new driveway, for more than just parking your cars, can be surprisingly affordable. Also, a new driveway can raise the property value of your home significantly. A well made driveway can pay for itself – and then some. If you are looking for an exceptional Concrete Contractor in New Orleans Metro Area, make sure that you call Bayou Concrete® for your concrete project. We will provide you with absolutely excellent results every time, whether your needs are commercial or residential concrete projects. Fiber Mesh or Wire Mesh Concrete: What’s Better?